Julia Hawkins is a prize-winning contemporary figurative artist based in Surrey near London, were she runs her private fine art studio. 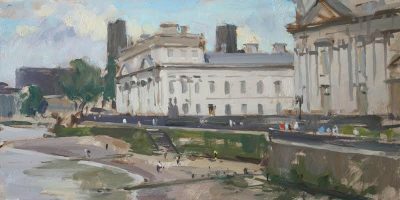 She is a regular exhibitor at the Mall Galleries in London with the ROI and other Federation of British Artists groups such as the Royal Society of Portrait Painters, New English Art Club and the Society of Women Artists. Her work has been selected for exhibitions such as the prestigious Lynn Painter-Stainers Prize and Ruth Borchard Self-Portrait Prize. A highly gifted draughtsman Julia’s works have a subtle yet confident quality, which show her vivid, distinctive technique. Her expressive portraits and landscapes reveal a diverse and experienced painter and colourist, who truly captures the essence of her subject. A number of her works are owned by private collectors in the UK and internationally, including the Richard Borchard collection. 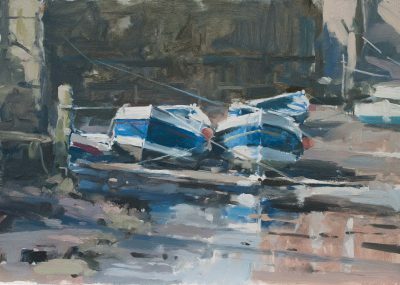 Julia’s schedule combines painting and gallery commitments, teaching practice and her work with Chelsea Art Society, where she is on the Society’s Council. Julia completed an MA in Graphics and Illustration at the Latvian Academy of Arts and studied drawing at the Riga studios of Professor Vitaly Karkunov. She worked as a freelance commercial and editorial illustrator before opening her own studio.